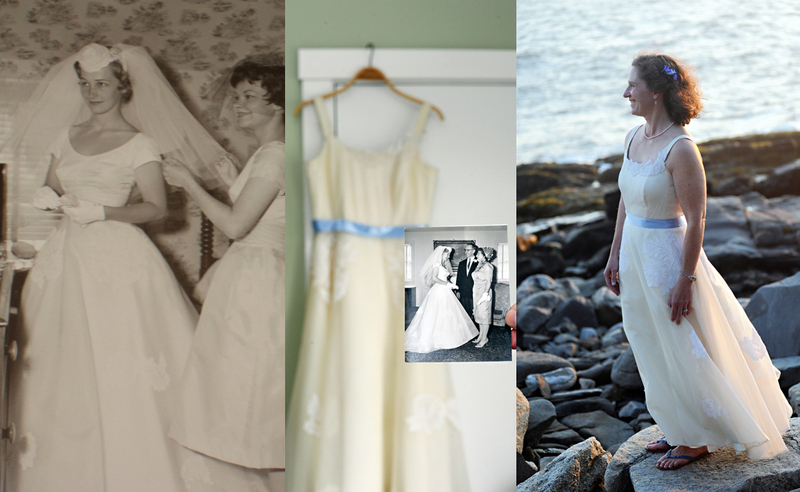 A vintage family wedding gown returns to splendor after a journey to the dress up box. Ruth approached Fermata Designs with a big challenge. 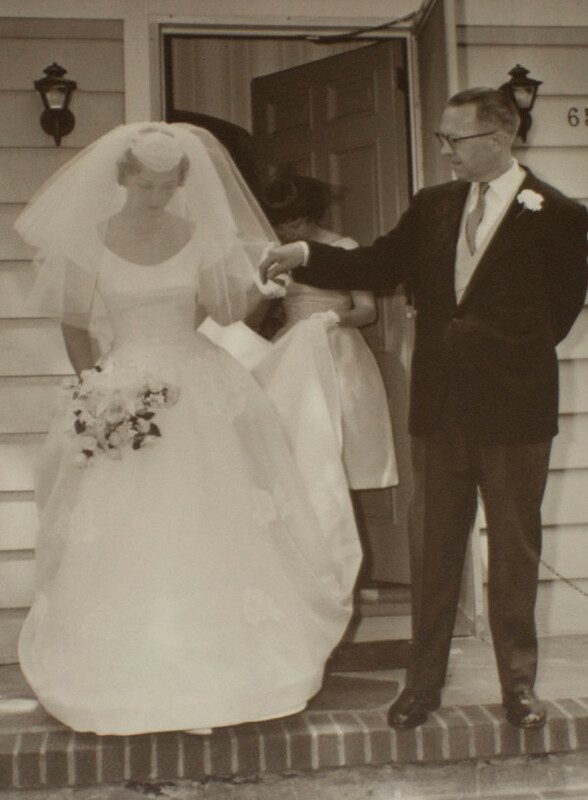 My mother’s 1961 wedding dress was a little girl’s dream, with layers of crinolines and hoops that held the skirt out wide. During a Gone with the Wind phase, my best friend and I would use the petticoats to pretend that we were Scarlett. 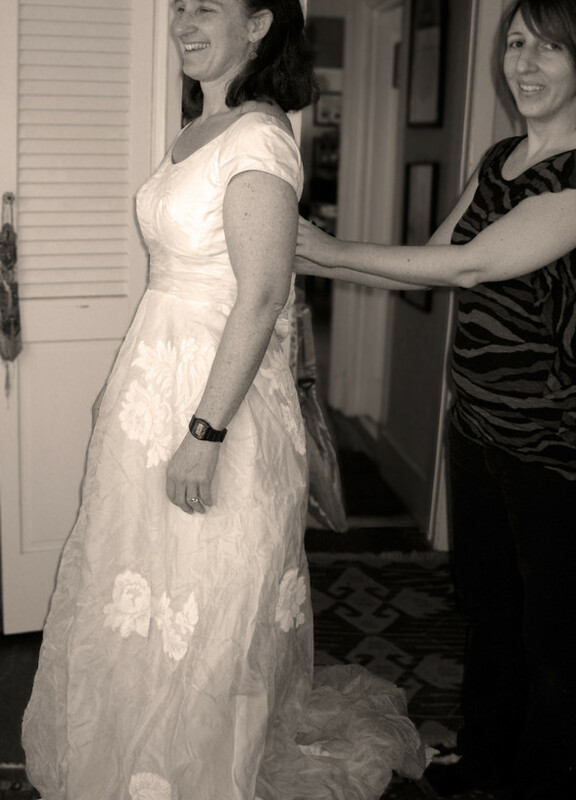 After years of play and decades of storage in trunks and boxes, though, the likelihood that my mom’s dress could be upcycled for my own wedding seemed slim. At our first meeting, Ruth presented us with her mother’s vintage dress. Challenge number one: the condition of the dress. Ruth was no longer interested in dressing like Scarlet O’Hara, so we had permission to remove the well worn crinolines. But the fabric was yellowed and a wine stain at the hem attested to the joyful merriment of her mother’s wedding. Challenge number two: the fit. Ruth was more interested in being comfortable than having a tiny waist on her wedding day, so corsets and cinchers were not an option. 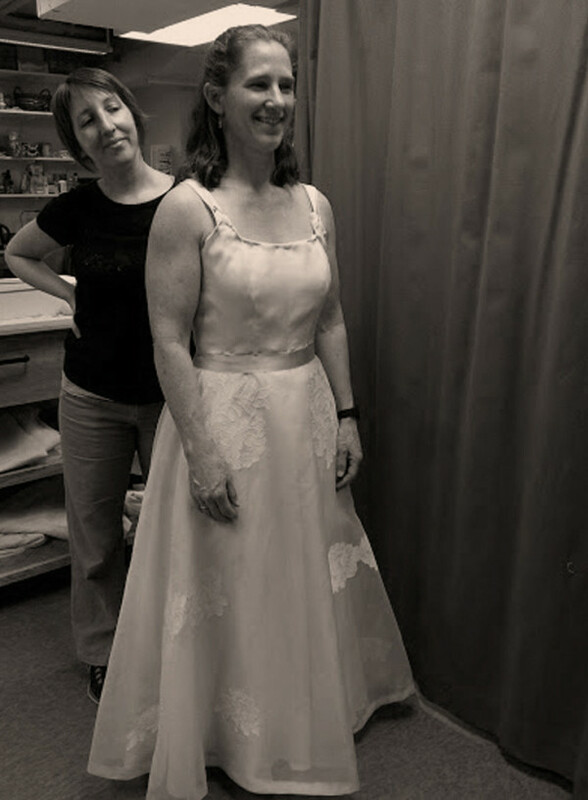 This gown needed to be refit to Ruth’s modern silhouette. Planning a casual outdoor wedding, Ruth wanted to shorten and slim the skirt of her mother’s gown. This allowed us to reuse that fabric to create a brand new bodice, custom to Ruth’s measurements. It also allowed Ruth to choose the style of the new bodice. She selected a simple tailored bodice with wide straps and scoop neck. 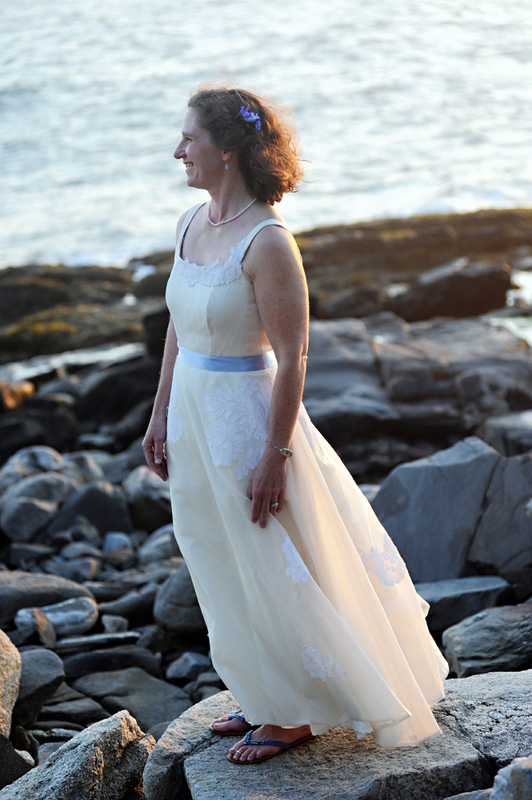 Reusing some of the lace from her mother’s gown, we added an floral accent to the neckline. 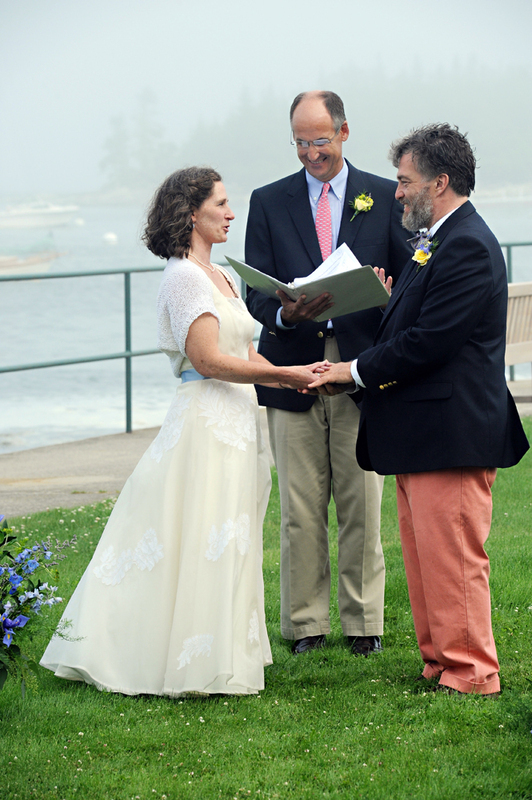 A new periwinkle blue silk ribbon accentuated her waist with a burst of color. 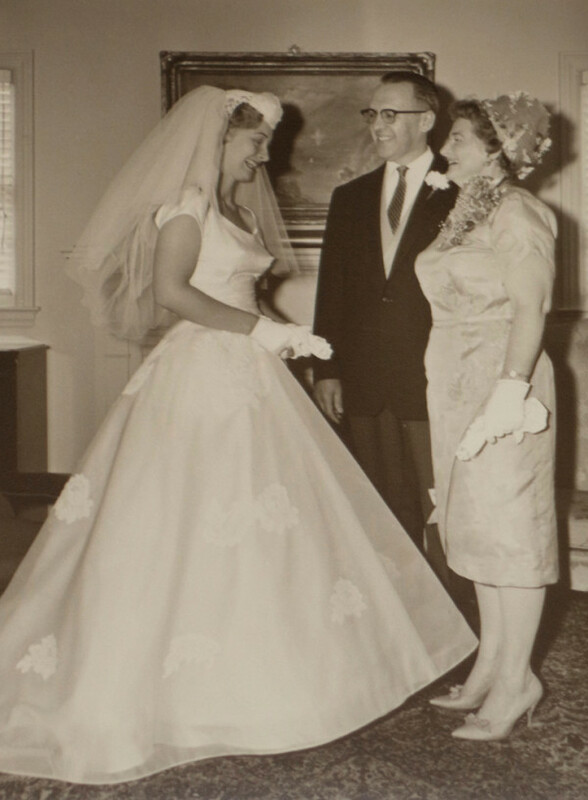 Now the formal 1960s gown was breezy and beautiful, perfect for Ruth and her occasion. With a lovely shrug she knit herself, she was ready for her big day! Finding a wedding dress was the part of getting married I dreaded. Very few modern designs appealed to me, and the expense and pressure associated with bridal shops was intimidating. 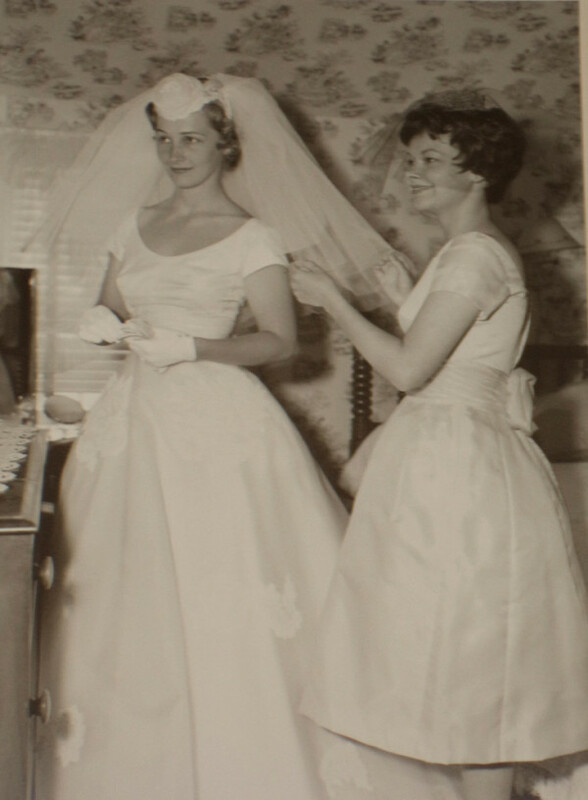 I had always admired the basic design of my mother’s dress, though the cap sleeves and the structured bust of the early 1960’s had to go! Of greater concern, the dress had spent most of my childhood in an old trunk and in more recent years had been living in a cardboard box, so I doubted it was worth saving. Finally, my mom had a 24-inch waist when she was married; I haven’t had a 24-inch waist since I was 10! Reworking her dress seemed like a long shot. A friend told me about Fermata Designs. From the start, Carla and Jocelyn were lovely – generous, patient, knowledgeable, and clear. Just the fact that the first consultation was free took a weight off of my shoulders, given the condition of my mom’s wedding dress. During that first visit, Carla and Jocelyn’s expertise and professionalism came across in every way, as they assured me that upcycling my mom’s dress was technically feasible and reassured me that the process could be pleasant and positive. They streamlined the process so I didn’t need to make the trip into New York too many times, and they were clear and straightforward about the costs, understanding of my budget. They listened to me and were sensitive both to my concerns and my ideas, and they worked well with each other to help bring life to my vague vision. I was impressed throughout with their creativity and attention to detail. Time and again, they went the extra mile to use original material and to work with me in creating a dress that recalled my mother’s gown but was its own unique piece. It was a wonderful collaborative experience. The final dress was just what I had hoped for; it recalled my mother’s original gown but it was my dress, too, a unique piece with a sense of history and connection. My mother loved it, my father didn’t recognize it, my photographer said she’d never seen better work in an upcycled dress, and knowledgeable friends were impressed with the handiwork. In the end, what I dreaded the most turned out to be one of the most positive and satisfying parts of planning my wedding; the final dress was everything that I wanted. I can’t thank Carla and Jocelyn enough for the amazing work they did.